A blend of Iowa Marechal Foch and Syrah grapes. Full bodied with ample fruit. Serve at room temperature with prime rib. A blend of Marquette and Syrah grapes. ​A tribute to a man outstanding in his field. Roger, our Dad, loved his vineyard and it seemed appropriate we dedicate this dry red wine in his memory. Serve with blue cheese burgers or barbecue. Oaked dry red wine that is produced from Marquette and Syrah grapes. Serve at cellar temperature with red meats. Our Marquette Rosé is crisp & clean with notes of Cherry and Strawberry. Pairs well with grilled chicken or fish. This semi-dry wine is produced from the Frontenac grapes which is grown in our original vineyard at the Rohde family farm. 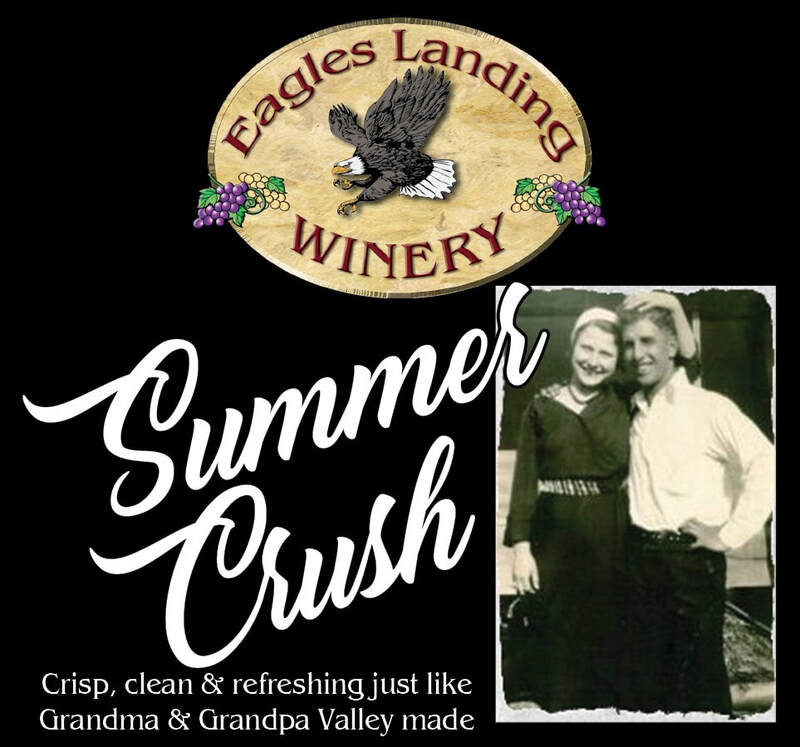 This wine is in memory of Jay's Grandparents Ben and Millie Rohde. Semi-Sweet red wine made from the Frontenac grape. Mrs. Sippi is sweeter than Mr. Sippi because "Mrs." is always sweeter than "Mr." Serve chilled. Our own sweet Concord grape wine finishes with a character all its own. This wine is in memory of Grandma Ruby Halvorson. Serve chilled with light foods & cheeses. An American white grape wine that is clean, crisp and subtle. Pairs well with seafood or fowl. This wine is in honor of Connie, our Mom. Connie is known for her sweet, kind personality. To know Connie is to love Connie. A tribute to a man outstanding in his field. Roger, our Dad loved his vineyard and it seemed appropriate we dedicate this Brianna grape wine in his memory. Serve slightly chilled with seafood or fowl. This Valvin Muscat grape wine is crisp and semi-sweet with a hint of grapefruit. This wine is a surprising delight to enjoy with every occasion. ​ A semi-sweet white wine produced from the Seyval ​Blanc grape. Serve chilled with fried fish, chicken or pork. This La Crescent Grape wine combines exquisite fruit flavors of pineapple with invigorating acidity. This wine is in memory of Grandpa Vic Halvorson. Our own semi-sweet white wine that will make you hum "The Sound of Music". Serve with seafood and fowl. ​"Arnie The One Man Band". An all-purpose semi-sweet Catawba Grape wine. Serve chilled with baked goods such as scones, cookies and fruit pies. Huge, juicy raspberry flavor from start to finish. Crisp and not too sweet, it would be a hit at any salad luncheon. Big Red served with a nice mixed salad topped with grilled chicken and a splash of raspberry vinaigrette would be the hit of the party! Just sweet enough to go with fruit desserts like raspberry tiramisu. This semi-sweet blueberry wine has a pretty, light ruby color, plus aroma of fresh berries. The pleasantly sweet finish is reminiscent of a berry jam. Intense blackberry nose, distinctive fresh fruit in palate. Superb berry finish with lingering natural fruit sweetness. Great with a medium flavored cheese board or would be a wonderful reduction sauce for a pork tenderloin. Campfire Hootch has become our best-selling wine. Rich aroma, like a fresh cup of mixed berries, pleasantly balanced, fruity through the palate, lovely crisp finish. This easy drinking wine, can stand alone or with a cheese board of Havarti, Brie, blue cheese and Gorgonzola. Campfire Hootch is perfect for hanging out around the campfire until the wee hours of the night - sipping Hootch and singing songs. It can be a holiday everyday with this sweet and tart cranberry wine. Cheers is best served with pheasant, quail, turkey or pork. A hint of peach nectar, serve chilled with cobblers or Iowa pork This limited production seasonal wine is released in the Spring. Come in and sample this Gold Medal winning wine while it's still available. Our Spiced Pumpkin wine is light, refreshing and slightly sweet. Named for our Grandchildren who are our Lit'l Punkin's! This Rhubarb and Strawberry wine showcases the sassiness of the winemaker's better half. Served chilled on its own or with light dishes. Apple wine fermented with organic cinnamon, orange peel, allspice and cloves. Whether you serve it chilled or warmed, it's a must for the Holidays! This strawberry wine is a liquid strawberry shortcake. Serve chilled with sugar cookies or a light light dessert. This spicy cousin to America’s cranberry is made from imported sweet, tart Scandinavian lingonberries. This wine is in memory of Great Uncle Orrin. You couldn't get any more Norwegian than Orrin......UffDa! This semi-sweet wine has a refreshing taste of ripe cherries with a slightly sweet well-balanced flavor. Named after Jay, loving referred to as "Papa" by our Grandchildren. A white port style wine produced from the LaCrescent grape has immense tropical/apricot aromas and flavors that engulf the mouth. Blackberry wine bursting with real chocolate flavor makes this Best of Show and Double Gold Award winning dessert wine an Autumn treat. Autumn Splendor will be released around the first of October every year. Delectably sweet strawberries are enrobed in rich creamy chocolate to create an unforgetable taste experience to be savored. Mi Amor is a seasonal wine bottled in January for Valentine's Day. Available in a heart shaped bottle or a 750mL bottle. Enjoy the tartness and sweetness of fresh red raspberries with a hint of chocolate. This Best of Show and Double Gold Award Winning Wine is delightful! !